If you want to work where the action is, how about a job in the fastest-growing occupation in America? As a wind-turbine technician you could make about $50,000 a year and know that your career is expected to grow 108 percent in the next seven years, says the U.S. Bureau of Labor Statistics. And you’d be part of the cutting-edge essence of the American economy, according to a report on electric utility jobs. 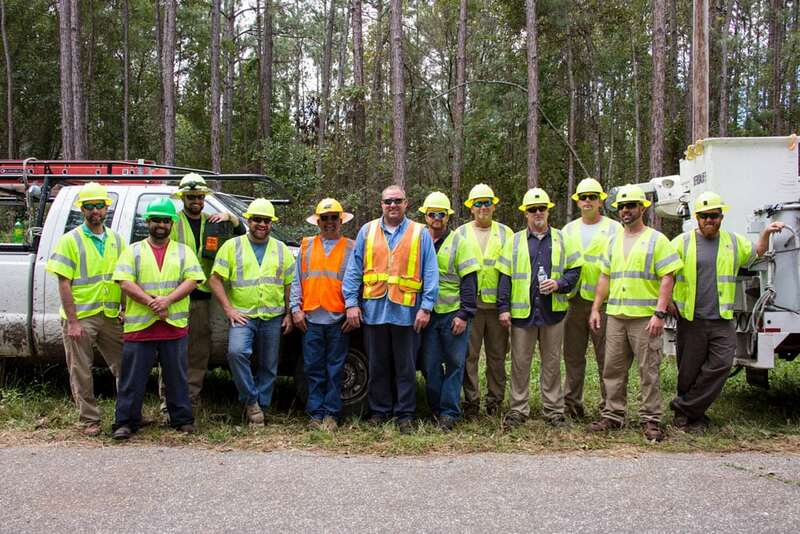 The National Rural Electric Cooperative Association (NRECA) sponsored that study, along with two other national utility groups, to show how electric utilities power the economy as a result of lighting our homes and businesses. Powering America cites the utility industry as the most capital-intensive economic sector, investing more than $100 million a year on the nation’s electricity infrastructure with advances in technology, environmental protections and other improvements. And that’s in addition to money spent on regular operations and maintenance. All that adds up to supporting more than 7 million jobs. 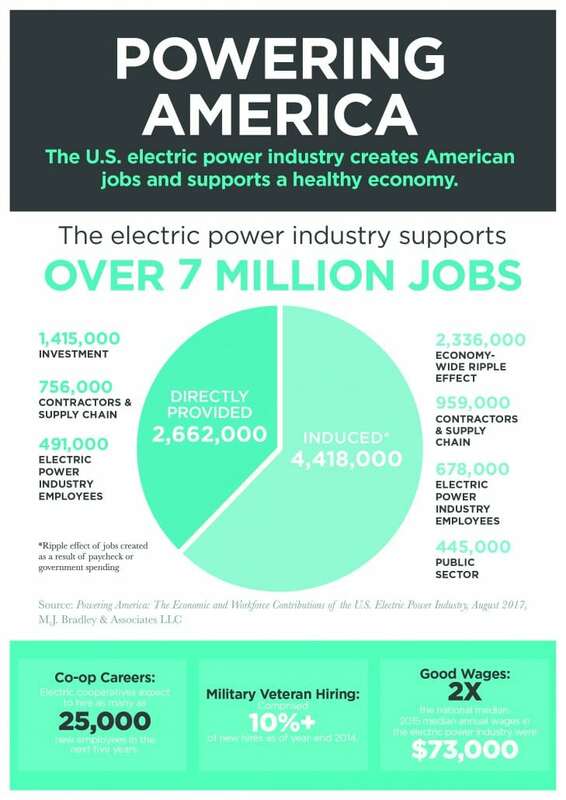 More than 2.6 million of those jobs result from direct employment, like utility employees and contractors. As all those people go to work and live their lives, they create another 4.4 million “induced jobs”—teachers, doctors, real estate agents and service workers. The report calculates the economic impact of the electric power industry at $880 billion—about 5 percent of the nation’s $18 trillion Gross Domestic Product. The U.S. Department of Energy slices and dices those numbers a different way, shedding a little more light on wind-turbine technicians and other renewable energy jobs. Wind power jobs may be growing rapidly, but the DOE report lists solar energy jobs as the largest share of people working on all types of electricity generation. Almost 374,000 people are working in solar power—43 percent of the electricity generation workforce. Wind employs about 100,000 people. Those renewable energy jobs are in addition to a raft of other careers in energy, from mining, to energy efficiency, power plant operators, and social media and cyber security specialists. Jobs at electric co-ops especially offer openings in cutting-edge careers, says Michelle Rostom, director of workforce development for NRECA. Part of the reason those jobs will be available is that the large Baby Boom Generation is retiring—Rostom says 6,000 co-op employees retired last year. Other parts of the energy industry went through that wave of retirements several years ago, but Rostom says it’s just catching up with electric co-ops. “People stay at the co-op for so long because they’re great jobs, with interesting work, a chance to grow professionally in a lot of different areas and they have a strong connection with their local communities,” says Rostom. Electric co-ops formally addressed that need to hire more talent when NRECA set its six strategic objectives, one of which is to develop the “Next Generation Workforce.” In 2006, NRECA joined with other national groups to form the Center for Energy Workforce Development as a way of making sure jobs get filled with high-quality workers. NRECA sees military veterans as part of the solution: Another part of Rostom’s job is coordinator of NRECA’s Serve Our Co-ops; Serve Our Country veterans hiring initiative. Locally, co-ops employee more than 2,600 Tennesseans, and we are always hiring. Visit tnelectric.org/about/careers/ to learn more.